How do I get my horse to slow down on group trail rides? 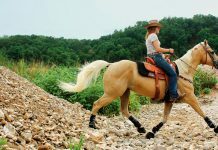 Q: My gelding has a lot of energy and loves to gallop when we trail ride. If I’m galloping with a group, I feel like he won’t stop or slow down until he’s run past the front horses. I’ve tried circling to slow him down, but he ignores me. My friends suggested a stronger bit with long shanks. Will that work? What else should I do? A: Many riders keep more than one bridle or bit on hand for their horse and switch back and forth, depending on the plans for the day. A more substantial bit might be reserved for high-performance work or rambunctious group activities. But merely resorting to a tougher bit to control your assertive gelding won’t work unless he’s been schooled to respect your aids when ridden in a milder one. After you’ve worked off some of your horse’s excess energy by turning him out or longeing him, concentrate on retooling his brakes. Work him in an arena or enclosed area. Practice transitioning from one gait to another. Intersperse work at faster gaits with several laps at a walk. When you do circle your horse to slow him down and collect his stride (which will give you more control), make your circles about the diameter of a longe line. Spinning him around in tight loops will only antagonize and rile your horse. If it seems like you need some guidance, seek help from a riding instructor in your community. You might discover that a few lessons will do wonders to improve your relationship with your horse. 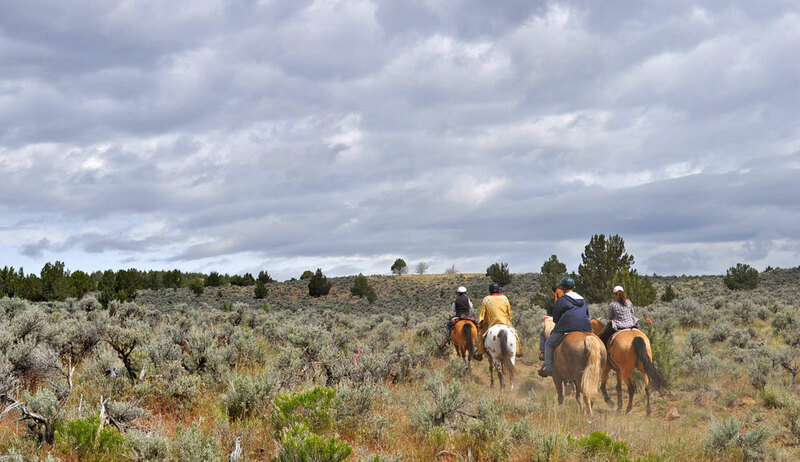 When you’re ready to return to the trails, don’t enable your horse’s tendencies by galloping in a group. He no doubt has a dominant personality and that, coupled with his high-energy drive, causes him to view group gallops as a race. He’s overcome with herd mentality rather than paying attention to you. So first try just walking and jogging together. Include the basics that you’ve worked on in the arena. There’s no reason why you can’t all do some large circles, halt and pause while you chat, and walk on a loose rein. Your riding pals should support you in your effort to be safe. Good advise….first a horse must learn to respect your clues or commands at walk, trot, lope, etc. Stronger bit is not the answer. My friend and I, who go out on the trails ALL the time, practice things that we could practice in the ring…like bending and expanding and reducing the trot. So in helping those “brakes”, try to keep your horse’s mind occupied and more focused on you. I HOPE I DINT OFFEND ANYONE, BUT MY COMMENT BELOW IS JUST MY SHEER OPINION FROM MY EXPERIENCES. I INTENDED NO HARM, OR TO UPSET ANYONE. I APOLOGIZE IF YOU FEEL THAT WAY.